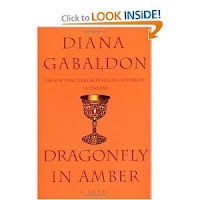 FINALLY finished Dragonfly in Amber by Diana Gabaldon. I've been reading this book forever! Of course, it IS over 900 pages, so I guess I can cut myself a break. I've been reading it for so long that I have like five magazines piled up from the last month and a half. The copy I read is a used copy that I purchased somewhere...but I'm not sure where. I got it before I joined BookMooch, so it wasn't a Mooch. It's possible that I bought it at Powell's during the summer that I lived in Portland, while working for the Department of the Interior in law school. ANYWAY, this is the second book in Gabaldon's Outlander series. And it's a re-read for me. I seriously love these books. This one wasn't as good as Outlander was, however. Too much Paris intrigue. Quick synopsis (SPOILER warning): this book was a little confusing because it switched time periods. In 1968, Claire and her grown daughter Brianna return to Scotland so that Claire can tell Brianna the truth about her birth (that Frank Randall, Claire's husband, is not really Brianna's father; rather she was fathered by Jamie Fraser, Claire's OTHER husband, in 1745 Scotland...trust me, it makes more sense if you read the series from the beginning). As they look into the historic fates of the men who lost their lives in the Scottish Rising of 1745 at Culloden Field, Claire is frightened of what she may find...that her husband Jamie was killed at Culloden after she left him to return to her own time. While telling Brianna and Roger Wakefield about her experiences in the past, we flash back to 1740's Paris, where Jamie and Claire are trying to stop Bonnie Prince Charlie from gathering support and funds for the Rising, knowing that many Scottish Highlands clansmen lose their lives in the fight. Claire is pregnant and, during this time, loses the baby, whom they name Faith. They then travel to Scotland, as the Prince has forged Jamie's name on a document showing support for the Uprising, and they are forced to then outwardly support Charles' efforts to retake the throne. Claire ends up pregnant again, and Jamie, having killed the MacKenzie clan chieftain, sends her away through the standing stones, back to her own time, while he goes to meet his fate at Culloden or at the hands of the clan MacKenzie. 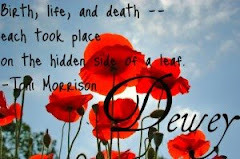 The book ends in 1968 Scotland again, with Claire learning that Jamie really did NOT die at Culloden, leaving the series open for further novels. Whew! I'm sure that sounds ridiculous to anyone who hasn't followed the series, but Gabaldon is gifted, in that she makes even the most ridiculous plot points sound completely believable. I really didn't care for the section where they were in Paris. It was kind of boring to read about the society goings-on, and political intrigue isn't really my thing. This book was VERY political and focused a lot on the military maneuvers of the Scottish army. This stuff slowed the novel WAY down for me. I would have liked more of the Claire-and-Jamie-on-the-run type storyline from the first novel. But, if I recall correctly, the third book gets back to that. I would give this book four out of five Whatevers. It's still REALLY good, and is a must-read for anyone who loved Outlander, but there were some elements that I didn't care for.